This is a listening exercise which I use with my B2 students so as to give them some extra listening practice. The actual recording that accompanies the worksheet can be found on the BBC site, The English We Speak. The studenys are given the handout and I let them read it over, just in case there is any vocabulary that needs to be explained. I do not however explain the expression which is the backbone of the listening task. Afterwards I usually play the recording. If the students are a bit weaker I let them listen to the recording twice. I have included a scanned copy of my answer sheet with my handwriting on it. I hope it's helpful. Sorry if there is some Greek written on it here and there. 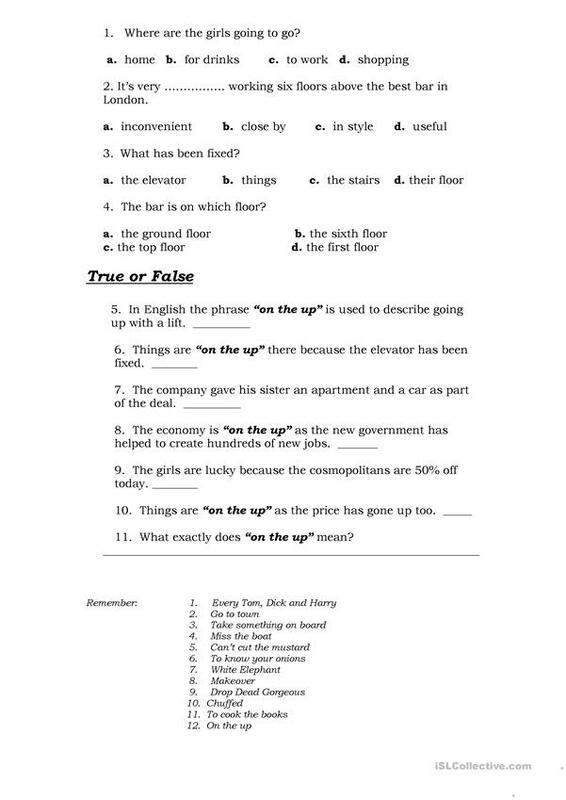 The above downloadable worksheet was created for business/professional students, high school students and adults at Upper-intermediate (B2) level. It was designed for working on your students' Listening skills. The answers are provided, too. Athena76 is from/lives in Greece and has been a member of iSLCollective since 2013-09-03 09:40:56. Athena76 last logged in on 2019-04-25 10:34:51, and has shared 19 resources on iSLCollective so far.